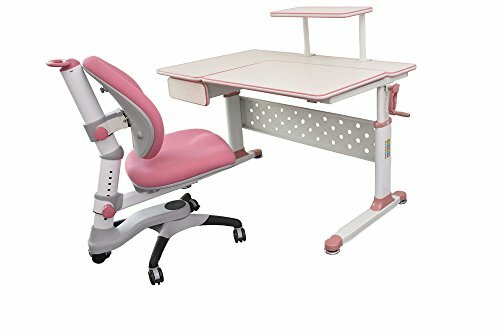 Little Soleil Children's Adjustable Desk - New 2nd generation Little Soleil Series Height Adjustable Kids Desk now comes with drawer and a desk shelf as part of the set! Height adjustment range has improved, allowing little ones to raised or lowered from 21 to 31 inches high. Split top tilts up to 75 degrees. Top is made of anti-scratch, anti-scuff and easy-to-clean laminate surface which makes maintenance a breeze. Built-in individual leg levers ensure a firm footing regardless of the surface, while rounded corners and rubber bumpers on the surface edges are all designed to minimize bumps and bruises while in use. Overall product dimensions: 44" W x 27.6" D x 28" H. Overall product weight: 63 Lbs. What's in the Box - Unassembled desk, one drawer, one desk shelf, and installation guide. Little Soleil Children's Adjustable Chair - The Little Soleil line of adjustable chair is designed with your child's growing needs in mind. Seat height, seat depth and backrest can be adjusted independently with ease by twist n lock knobs. Simply twist open the knob, slide seat and backrest along anchoring rods and lock them into desired positions. It features a five-caster base, and comfortable seat and backrest. Chair is designed to swivel 15 degree left and right when casters are locked.